That was July 4, 2014. When the priest woke up, he told Catholic News Service, he was “in a small room with a window blurred and walls painted with ugly green color. That reminded me of some Soviet children’s camp or sanatorium. In an interview with CNS, the priest recalled his 12 days in captivity and said it was worse emotionally than physically. Father Kulbaka said he knew he was detained for helping to organize an interfaith prayer initiative in the center of Donetsk, which became a headquarter for Russian-backed separatists and various gangs that occupied Eastern Ukraine. The prayer initiative had started the previous February, when interfaith leaders gathered at a tent each day to pray for peace in Ukraine.The tent repeatedly was broken, and organizers were threatened. 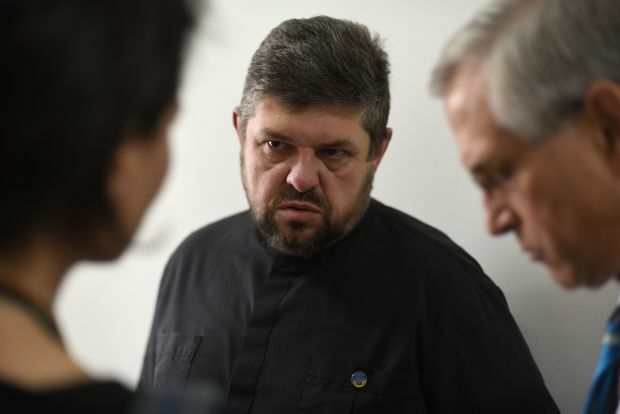 Other clergy from Eastern Ukraine had been targeted: the Rev. Sergey Kosiak, a Protestant pastor, had been beaten. Another organizer, Polish Father Pawel Witek, had been abducted by pro-Russian militants, and Orthodox Father Pavlo Zhuchenko had been shot dead at a military checkpoint. Father Kulbaka said Rev. Kosiak and a mufti, Said Ismagilov, started negotiations with different gangs to rescue him. Father Kulbaka said that, at the time, he did not know who captured him. He said he suffered cold, sickness and humiliation. The torturers also took away his first-aid kit with medicine for diabetes. He survived three mock executions. “They put me near the wall and shot over my head. When it happened for the first time, I was so scared that I fainted. But they laughed, they had fun,” the priest recalled. On the eighth day, a man with a Russian accent accused Father Kulbaka of being a Catholic. It was not even interrogation, Father Kulbaka said, noting it was more of the monologue of accusations and jeer. This man knew the religious situation very well, the priest recalled: He even knew the names of the parishioners in Donetsk. The people who kidnapped Father Kulbaka call themselves the Russian Orthodox Army. Although officially denounced by the hierarchy of the Ukrainian Orthodox Church of the Moscow Patriarchate, this military group often speaks of its commitment to the Orthodox faith and ideas. After three days, the “interrogations” were over. Father Kulbaka said he does not know why his captors released him, but they put him in his car, left him in a small forest and gave back a cellphone and a laptop. When Father Kulbaka managed to reach his brother, who lived in nearby Dzerzhynsk, he received a text message with a threat to leave the region and not discuss his captivity. After he reached Kiev, he lapsed into a diabetic coma and, for few days, was in a very poor condition. But his spiritual battle began when he regained consciousness. At some point, he started praying for his torturers. “Prayer was the instrument that transformed me and my attitude to them. And the Lord touched my heart,” he told CNS. “Forgiveness has changed my physical condition,” he said, adding that he started recovering from the consequences of the captivity — a recurrence of cancer, a stomach ulcer and other diseases. The U.S. Conference of Catholic Bishops helped him with funds for the surgery and rehabilitation. In June, a USCCB delegation was able to see him briefly in Lviv during a visit to Ukraine. Father Kulbaka said he treasures his current feeling of peace. “God gave me this blessing and I am afraid of losing it,” he said.